A women's 400 metre hurdles race on a typical outdoor red rubber track. Athletics, also known as track and field or track and field athletics, is a collection of sports events that involve running, throwing and jumping. The name is derived from the Greek word "athlon" meaning "contest". Some languages (e.g. German and Russian) refer to these sports as "light athletics" to distinguish them from "heavy athletics," like weight lifting, wrestling, etc. Athletics was the original event at the first Olympics back in 776 BCE where the only event held was the stadium-length foot race or "stade". The Roman Games – Arising from Etruscan rather than purely Greek roots, the Roman Games deemphasized footraces and throwing. Instead, the Greek sports of chariot racing and wrestling, as well as the Etruscan sport of gladiatorial combat, took centre stage. Other peoples enjoyed athletic contests, such as the Celts, Teutons and Goths who succeeded the Romans. However, these were often related to combat training, and were not very well organized. In the Middle Ages the sons of noblemen would be trained in running, leaping and wrestling, in addition to riding, jousting and arms-training. Contests between rivals and friends may have been common on both official and unofficial grounds. Many athletic sports have found favour in Europe throughout the ages. However, in Britain they fell out of favour between the 13th and 16th centuries due to government restrictions on sports aiming to reduce the practice of archery. After this ban was lifted in the 17th century sports began to flourish once more, but it was not until the 19th century that organization began to appear. This included the incorporation of regular sports and exercise into school regimes. The Royal Military College, Sandhurst has claimed to be the first to adopt this in 1812 and 1825 but without any supporting evidence. The earliest recorded meeting was organised at Shrewsbury, Shropshire in 1840 by the Royal Shrewsbury School Hunt. There are details of the meeting in a series of letters written 60 years later by CT Robinson who was a pupil there from 1838 to 1841. 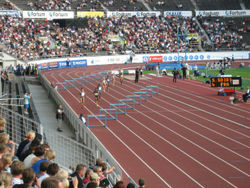 Modern athletic events are usually organized around a 400 metre running track, on which most of the running events take place. Field events (vaulting, jumping, and throwing) often take place in the field in the centre of the running track. Many athletic events have an ancient origin and were already conducted in competitive form by the ancient Greeks. Athletics was included in the first modern Olympic Games in 1896 and has been part of the program ever since, providing the backbone of the Olympics. Women were not allowed to participate in track and field events in the Olympics until 1928. An international governing body, the IAAF was founded in 1912. The IAAF established separate outdoor World Championships in 1983. Other major events include the World Indoor Championships and the European Championships. The sport has a very high profile during major championships, especially the Olympics, but otherwise ranks well down the list of sports by public interest in almost all countries. The leading regular circuit of events takes place in Europe each summer, and includes the Golden League events. The AAU ( Amateur Athletic Union) was the governing body in the United States until it collapsed under pressure from advancing professionalism in the late 1970s. A new governing body called The Athletics Congress (TAC) was formed, it was later renamed USA Track and Field (USATF or USA T&F). An additional, less structured organization, the Road Runners Club of America (RRCA) also exists in the USA to promote road racing. Both organizations allow athletes to receive money for racing putting an end to the " shamateurism" that existed before. There are two seasons for track and field. There is an indoor season, run during the winter and an outdoor season, run during the spring and summer. Most indoor tracks are 200 meters, however, less frequently, there are smaller and larger tracks that measure from between 145 (11 laps to a mile) to 300 meters. 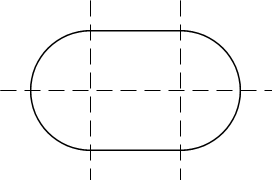 The indoor track consists of four to six lanes instead of the eight to ten on an outdoor track. Often an indoor track will have banked turns to compensate for the tight bends. In an indoor track meet athletes contest the same events as an outdoor meet with the exception of the 100 m and 110 m/100 m hurdles (replaced by the 60 m sprint and 60 m hurdles at most levels and sometimes the 55m sprint and 55m hurdles at the high school level), and the 10,000 m run and 3,000m steeplechase. Indoor meets also have the addition of a 3,000 m run normally at both the collegiate and elite level instead of the 10,000 m. The 5,000 m is the longest event commonly run indoors, although there are situations where longer distances have been raced. In the mid 20th century, there was a series of races 'duel races' at Madison Square Garden's (NY) indoor track, some of which featured two men racing a marathon (26.2 miles). However, this is an extremely rare occurrence, for obvious reasons. In some occasions, there may also be a 500 m race instead the open 400 m normally found outdoors, and in many collegiate championship races indoors both are contested. In the field events, indoor meets only feature the high jump, pole vault, long jump, triple jump and shot put. The longer throws of javelin, hammer and discus are added only for outdoor meets, as there is normally not enough space in an indoor stadium to house these events. Other events unique to indoor meets (especially in the United States) are the 300m, 600m, 1000m and 35 lb. weight throw. In some countries, notably Norway, standing long jump and standing high jump are also contested. For multi-event athletes there is the Pentathlon for women (consisting of 60m hurdles, high jump, shot put, long jump and 800m) and heptathlon for men (consisting of 60m, long jump, shot put, high jump, 60m hurdles, pole vault and 1000m). The outdoor track and field season begins in the spring and may last through the summer. Usually the tracks are an oval shape track of 400 meters. However, some old tracks are still measured in yards, so they measure 440 yards. The track consists of 6-10 lanes and, for the bigger tracks, a steeplechase lane with a water pit. This can be inside or outside the track, making for a tighter turn or a wider turn. Often schools will place a playingfield in the middle of the track, usually football/soccer/ lacrosse, due to their size and shape. This inner field is usually known as the infield. Recently, some of these fields have been made out of AstroTurf or FieldTurf instead of grass. Field events consist of the high jump, pole vault, long jump, triple jump and shot put. They also consist of the javelin, hammer and discus throws; however, often these are outside of the stadium because they take up a large amount of space and may damage grass fields. However, many tracks without a playing field in the middle use the infield for the throwing events. There are other variations besides the ones listed below but races of unusual length (e.g. 300 m) are run much less often. The unusual races are typically held during indoor season because of the shorter 200m indoor track. With the exception of the mile run, races based on imperial distances are rarely run on the track anymore since most tracks have been converted from a quarter mile (402.3 m) to 400 meters; almost all recordkeeping for imperial distances has been discontinued. However, the IAAF record book still includes the mile world record (currently held by Hicham El Guerrouj of Morocco for men and Svetlana Masterkova of Russia for women) because of its worldwide historic significance. Sprints: events up to and including 400 m. Common events are 60 m (indoors only), 100 metres, 200 metres and 400 metres. Long distance: runs over 5000 m. Common events are 5000 m and 10000 m. Less common are 6, 12, 24 hour races. Relays: 4 x 100 metres relay, 4 x 400 metres relay, 4 x 200 m, 4 x 800 m, etc. Some events, such as medley relays, are rarely run except at large relay carnivals. Most American high schools run the 4x100 and 4x400, with the 4x400 being the finishing event to the meet. Road running: conducted on open roads, but often finishing on the track. Common events are half-marathon and marathon. The marathon is the only distance run in major international athletics championships such as the Olympics.